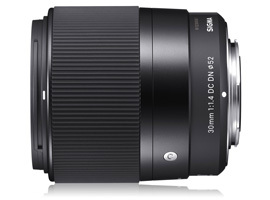 Part of Sigma’s DN range of lenses for mirrorless cameras, the Sigma 30mm f/1.4 DC DN C (Sigma 30mm f/1.4 DN) is a fast-aperture standard prime lens for Micro 4/3 lens mounts. Compatible with both Olympus and Panasonic Micro 4/3 mirrorless cameras, such as the Olympus OM-D E-M1 and the Panasonic GX7, the Sigma 30mm f/1.4 lens offers a 60mm-equivalent focal length for portraits and general-use photography. Featuring a bright f/1.4 maximum aperture, it’s a great option for low-light shooting environments, and the fast aperture, combined with its 9 circular aperture blades, produces attractive background bokeh and shallow depth-of-field effects. Optical construction uses 9 elements in 7 groups, including two aspherical elements for improved image quality; it has a compact design, and the built-in autofocus motor utilizes a stepping motor for quick and quiet autofocus during video capture. For easier use with filters, the internal focus system keeps the front element static during focusing, and the 30cm minimum focus distance makes closeup photography a possibility, too. Costing just $339, the Sigma 30mm f/1.4 DN is an affordable fast-aperture lens that opens up some new shooting possibilities for 4/3 shooters. Let’s see how it fares in our industry-standard lens tests. 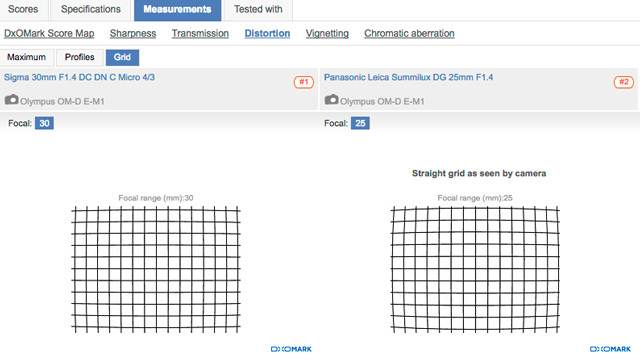 The Sigma 30mm f/1.4 DN achieves its best overall DxOMark score of 24 points on the Olympus OM-D E-M1. Its lens metrics display excellent light transmission at 1.7 TStop, as well as strong performances for both vignetting and chromatic aberration. While 0.9Ev vignetting (corner shading) occurs at the maximum f/1.4 aperture, it’s well-controlled from f/1.8, and completely eliminated between f/2 and f/16. Chromatic aberration (fringing) is not an issue at any aperture setting either. Some minor barrel distortion of 0.8% is evident, and although it’s not overly problematic, if you require perfectly straight lines in your shots, some post-production correction is required. Vignetting, or corner shading, occurs only at the maximum f/1.4 aperture and is completely eradicated between f/2 to f/16. Chromatic aberration is very well-controlled at all aperture settings. The Sigma 30mm f/1.4 DN’s distortion grid shows curvature of 0.8%, which requires some post-production correction to achieve truly straight lines. In terms of sharpness, the Sigma 30mm f/1.4 DN doesn’t fare quite as well, with uniform edge-to-edge resolution not achieved at wider aperture settings up to f/11. The greatest resolution was recorded at f/2.8, where it achieves strong 70% acutance across a large part of the frame, before dropping to around 60% acutance in the far corners. At the maximum f/1.4, aperture sharpness is softer overall at around 60% acutance in the center, but this quickly falls away to around 55% in the outer field. F/4 is also sharp in the center, but as the aperture is stopped down further, resolution suffers. Although sharpness is a little more uniform at f/11 and f/16, acutance drops to around 50% at these narrow aperture settings. 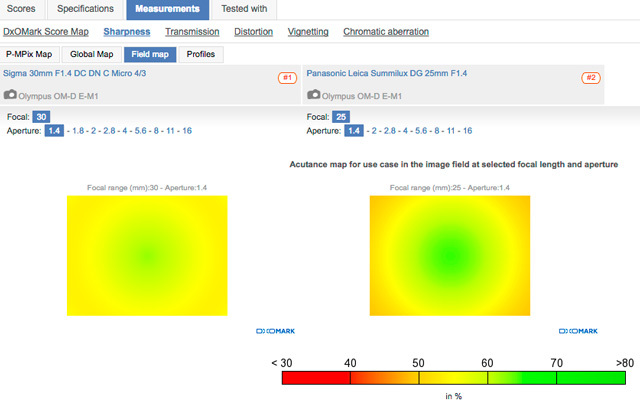 Tested on the OM-D E-M1, the P-Mpix map shows that the greatest resolution is achieved between f/2.8 and f/4. At f/2.8, good resolution around 70% acutance covers most of the frame, with sharpness just a little softer in the far corners. Tested on the Panasonic GX7, the Sigma 30mm f/1.4 DN achieves a lower overall DxOMark score of 19 points. 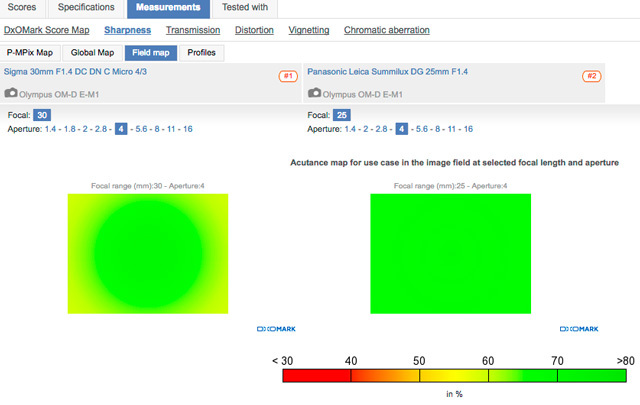 While it achieves the same lens metrics scores for transmission, distortion, vignetting, and chromatic aberration, a lower sharpness score of 5 P-Mpix has impacted the overall Panasonic result. Tested on the GX7, the same pattern for sharpness was observed, with uniform sharpness not a reality at the wider aperture settings. The greatest resolution is again achieved at f/2.8, but acutance is down to around 60% at this best setting, compared to 70% on the Olympus OM-D E-M1, and drops further to around 45% at f/16. Tested on the Panasonic GX,7 overall sharpness is down compared to the Olympus OM-D E-M1, but again, the lens resolves best using apertures between f/2.8 and f/4. 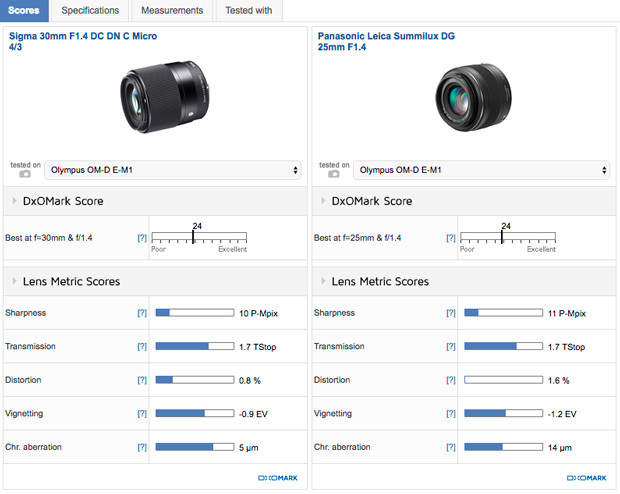 The Sigma 30mm f/1.4 DN achieves the same overall DxOMark score of 24 points as the more expensive $598 own-brand Panasonic Leica DG 25mm f/1.4, both tested on the Olympus OM-D E-M1. The Sigma lens achieves equal or improved lens metrics scores in most categories, with better distortion, less vignetting at the maximum aperture, and better handling of chromatic aberration in the far corners. The Sigma 30mm f/1.4 DN distorts significantly less than the Panasonic 25mm f/1.4. Perhaps more crucially, however, the own-brand Panasonic 25mm f/1.4 just edges it for resolution, with a sharpness score of 11 P-Mpix, compared to 10 P-Mpix for the Sigma. Each lens has its own strengths and weaknesses for sharpness, resulting in the close overall sharpness score, but the Panasonic’s better results between f/2.8 – f/8 give it the edge overall. At f/1.4, the Panasonic 25mm f/1.4 is slightly sharper in the center of the frame compared to the Sigma, but isn’t as uniform as the third-party option, resulting in softer results at the edge. The Panasonic is clearly better between f/2.8 and f/8, however, with the own-brand optic displaying good resolution and edge-to-edge sharpness at these settings compared to the Sigma, which isn’t as strong in the outer field. At the maximum f/1.4 aperture, the Panasonic 25mm f/1.4 is sharper in the center but the drop-off is more pronounced compared to the Sigma, which is slightly better at the edges at the same setting. Between f/2.8 and f/,8 the Panasonic lens clearly has the edge, with sharper and more uniform resolution. Boasting a fast maximum aperture and short minimum focus distance, the Sigma 30mm f/1.4 DN is a good standard prime option for MFT shooters. Sigma’s precision engineering ensures the good transmission, distortion, vignetting, and chromatic aberration results you’d expect from a prime. Sharpness isn’t outstanding, but it’s on par for a lens of this type, with the best results achieved at f/2.8 and f/4. The own-brand Panasonic 25mm f/1.4 does offer slighter greater and more uniform resolution at mid-aperture settings, but it distorts more than the Sigma, and fringes a little more in the very far corners, too. What’s more, it costs almost twice as much as the Sigma 30mm f/1.4 DN, making Sigma’s third-party alternative the better value-for-money option.